Just worth bearing in mind. 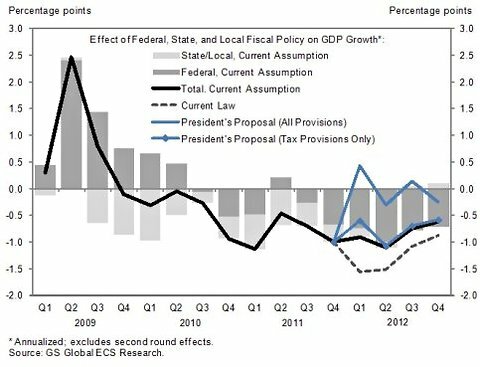 The graph (the line) shows the effect that total government fiscal policy, including federal, state, and local, has had / will have on GDP growth rate. In 2009, Q1-Q3, governments were having a very positive effect on GDP growth, adding up to 2.5 percentage points to the GDP growth rate. By 2009 Q4, though, this stimulus effort had deteriorated and was starting to have a negative effect, slowing GDP. Initially this was because state and local spending cuts were overwhelming the federal increases in spending. But the 2009 stimulus bill ran it’s course and the feds joined the austerity party and started cutting spending along with state and locals in late 2010. In 2011, our problems have been the austerity programs, the spending cuts at state, local, and federal level. Government has had it’s foot on the brakes trying to slow an already weak economy. It’s worked. The economy is coming to a halt. Unfortunately, the proposed jobs program isn’t really much of a stimulus. It’s too weak. It’s too small. And it’s focused too much on tax cuts that won’t be spent instead of spending. The blue line above shows the likely effects. Even if passed (a near impossibility given the Republican majority in the House), it will only reverse the contractionary effects of spending cuts without adding any new stimulus to grow GDP further. Stimulus is supposed to be about speeding up GDP growth – hitting the accelerator. Simply taking your foot of the brakes isn’t the same thing as hitting the gas. The graphic above covers the time frame of ARRA “stimulus” spending. ARRA was signed into law mid-Q1 of 2009 (Feb 17, 2009). According to the GAO $52.9 billion of ARRA “stimulus” was spent in 2009, $111.7 was spent in 2010 and $64 billion will be spent in 2011 with much, much less spent in 2012 and beyond. As can plainly be seen in the above graph the most GDP growth was in Q2 and Q3 of 2009 before much ARRA “stimulus” was spent. In 2010 and 2011 when over 2/3rds of ARRA money was spent GDP growth tanked and there is no indication that is gonna improve. Obviously, ARRA could not have been responsible for the Q2 2009 GDP growth spike. ARRA money was barely being rolled out in Q2. Since it is pretty obvious from this graphic and GAO’s accounting of ARRA spending that ARRA spending has barely helped the economy… if at all. Can you show me ANY conclusive data from the Great Depression to the present time that conclusively proves that Keynesian macroeconomic “stimulus” spending has ever worked? I ask only because I’ve spent a great deal of time looking for it and cannot find any. “So, where did the boost come from? A reduction in the trade deficit and government spending. Trade acted as a boost to GDP in the second quarter, adding 1.38 percentage points. U.S. exports fell by 7.0% and imports decreased 15.1%. As the prof says, it depends on where you spend, and how much. I would add “when” to that. If you wait till things get too bad, you convert lots of spenders to savers, and savers don’t add much to the velocity of money. Tax cuts only help those that are getting a paycheck and business wants to see customers with demand backed by cash, otherwise they’re savers too. And how about those falling interest rates? That pulls money back out of the economy (interest channel income). Looks like that dropped about 68 Billion from 2008 to 2009. US individuals and institutions were getting over 40% of that, over 60% if you count Gov’t and GI retirement funds and SSI. So did the Gov’t do a fair job of replacing the missing money and getting it in to the right hands? Not so hot. Wrong amount, wrong timing, wrong distribution. But wait, there’s more! Now we have the Supercommittee dreaming up ways to pull even more money out of the economy! And we’re paying them to do it.